« Music in the car to calm your dog who’s yelping and crying in his pet carrier! Do dogs really like wearing dog coats and sweaters? It seems like anywhere you go, you always see dogs in trendy tee shirts, sweaters etc. Last weekend, I was at the New York Pet Show and even though the temperature was in the 70’s, many people brought their dogs wearing a variety of tee shirts, sweat shirts and even dog coats. I even saw a dog wearing sun glasses. Are dogs uncomfortable wearing clothes? 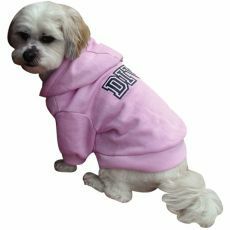 Many dogs do get cold in winter especially if they have a thin coat. In this case, a coat or sweater will really help to keep them warm. The only time that I think that it’s cruel, is when the clothing or accessories are hurting the dog or if it’s uncomfortably warm outside. If I were a dog, I probably would not want to wear any clothing except if it’s very very cold outside. Some people dress their dog for fashionable reasons which I disagree with. Some people even have their dog’s tail docked or ears cropped so that they could be “trendy” looking. Why put the animal through that? People do things like this for themselves not for their dog. This entry was posted on Tuesday, May 25th, 2010 at 8:38 pm	and is filed under Dog Treats, Pet Supplies. You can follow any responses to this entry through the RSS 2.0 feed. You can skip to the end and leave a response. Pinging is currently not allowed.